Growing up on a farm during the early 80’s I was privileged to watch my folks try and make ends meet through the farming crisis. Luckily, my parents weren’t alone but had my Grandparents only three miles away to help each other out. My Grandparents, who survived the Great Depression, knew a thing or two about survival and making it through the leanest of times. Whether they realized it or not their daily example spoke into my life of small ways to save money. It really wasn’t any conversations that showed me but through daily example. Things that I thought were normal, but were anything from it. 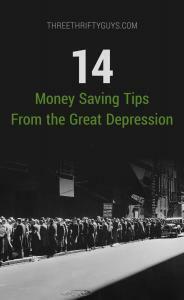 So, in the 18 years of being around my Grandparents (and Great Aunt & Uncles), here are 14 tips to save money that I learned from people who survived the Great Depression. Make Your Own Soap – my grandparents would periodically make giant blocks of soap in their basement. These blocks of soap would be cut up and packaged to last the entire year. The savings were small, but they were able to save money regardless. Use a Clothes Line to Dry Your Clothes – very rarely did my grandparents use their clothes dryer (especially during the summer), but would hang all their clothes on the four clotheslines they had in the yard. I specifically remember how hard our bath towels were, and thought this was common. Again, the energy savings during the 80’s was small from this but was another small step in pinching every nickel and dime. Reuse Old Socks and Shirts for Dish Rags – my grandparents didn’t own a single store-bought dishrag, but every rag was made from reused old clothing. Even if their clothing was no longer fashionable or worn, then it could still be used as a dish or oil rag. Eat Everything on Your Plate – no matter what meal Grandma served they would both lick the plates clean, and then mop it cleaner with a slice of bread. Also, whenever we’d go over to my Great Uncle’s house (Grandpa’s brother), then he’d do the same thing. Grandpa and Norman always reminded me the importance of eating all that is served, because of how they went without during the Depression. Repair Everything – Grandpa always worked to extend the life of everything he owned whether it be with duck tape, welding, or modifying. It was always a matter of taking care of what you own through general maintenance or getting a few more days out of an old part. Make Your Own Clothes – my grandparents always talked about how they would make their own clothes, and to my surprise, they’d even reuse old flour bags. Ya, in a recent conversation with my Great Aunt they would reuse 50-100lb flour bags to make dresses out of them. I doubt they’d use them for their “Sunday best”, but provided another set of clothes to wear around the farm. Reuse – Grandpa always told me how during the depression that there was a shortage of tires. My grandpa and his brother would always go to the local landfill and scour for old tires to repair and reuse. They always did what they needed to in order to just get by. Buy Wholesale – whether it was buying seed, flour, or parts, Grandpa always explained to me the benefits of buying wholesale, and how much money he’d save doing so. Grandpa spoke of how his parents would buy wholesale bulk items from town and store their large purchases in the attic. Helping Your Neighbor – unlike the times we are living in today, the years of the Great Depression forced a lot of people to help their neighbors out. Frequently, neighbors would share the produce in their gardens, assist in field work, assist with repairs, and lend machinery to one another. All of these steps would help people save money and make it through the Great Depression. Make It Yourself (versus paying retail) – after the Depression, I saw how often my Grandpa and his brother would make their own hog troughs, modified wagon parts, or combine parts. By making parts themselves they’d typically save 50% off what the local implements or parts dealer would charge. 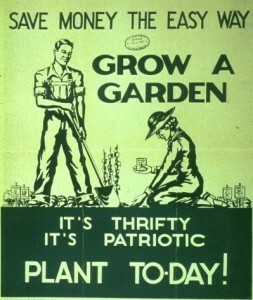 It’s again another reminder of how resourceful the Great Depression generation lived and another way they saved money. Detest Debt – for most people today a majority of their income goes toward paying interest on loans and credit cards. My grandparents always talked about how people got swamped by their debt payments as farmers headed into the Depression. As a result, a lot of farmers and families lost their farms due to this burden. In addition, Grandpa always talked about how certain folks would get swamped by credit cards, and how detestable that was. Grandpa always felt like debt was a disease or virus that needed to be avoided at all costs! He talked first hand about how his Dad lost a farm due to too much debt. The bitter taste of debt remained with him his entire life. Purchase (Don’t Rent) – Grandpa always loved the pride of owning his own land, machinery, or car. He always talked about how renters are just making someone else rich. Plus by purchasing things, then he was able to live debt free the last 40 years of his life. This philosophy helped save his family a lot of money over his 90+ years of life! Paid Cash for Everything – if they didn’t have the money physically in their hands, then they wouldn’t buy it. Often times they weren’t allowed to pay by check because a lot of checks would bounce. Much like Dave Ramsey talks about, they wanted to feel the money leave their hands. It often made it harder to part with the money when you paid with cash. Buy used – because of how quickly assets would depreciate, my grandparents would always seek to buy used first (or even get it from the local landfill) before going to the store to buy it new. From growing up around Grandparents, these are a few of the small things I picked up about how the Great Depression shaped their life. I saw in their lives the small money saving tips that they believed in passionately. I’m sure I’m not the only one who grew up around Great Depression relatives. 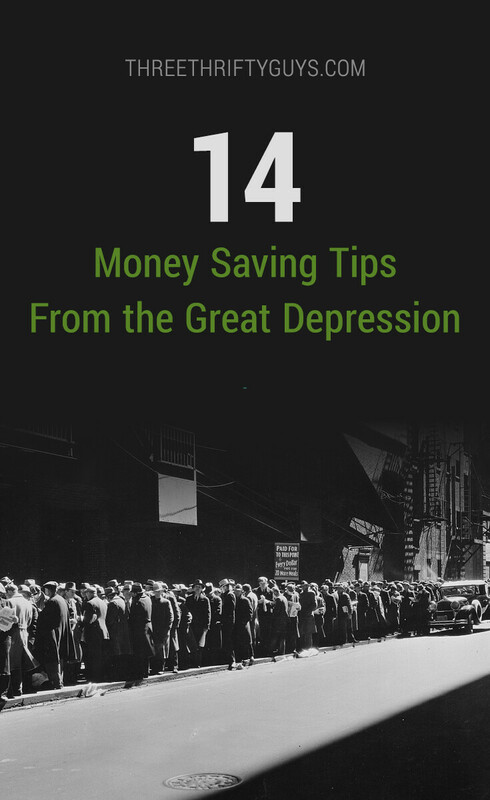 I’d be interested in hearing how some of our readers witnessed their relatives save money as a result of the Great Depression. What money saving tips do you have to share? FreedomPop Review – Is Free All It’s Cracked up to Be? My parents lived in the Depression. They never discussed money at all, unfortunately. So my tips are based on observations growing up. Buy the kids’ clothes from garage sales. We got a pr of pants, 2 tops and a pair of sneakers for the school year. The rest was garage sale items. When shopping for clothing, try it all on and then walk the store. Decide if you really need these items before buying. There weren’t computers back then, but the idea is the same. Think about a purchase, over several hours or days before buying. Work 2 jobs to pay off the mortgage. Mom worked 2 jobs. Dad worked one. She wanted the house paid off ASAP. And she did it. Make regular deposits to your financial institution to save money. They had a savings account and after the house was paid off, leftover cash was put into savings. Use cd’s as a savings vehicle. Mom would put $ into certificates of deposit. Nowadays, the interest on that money is paltry. There may even be better ways to save money but that was a good choice at that time. I still do this as well. Dad fixed the cars and various things around the house. I asked him to make me an earring holder and he took a square of MDF board and drilled holes in it. He taught us girls how to fish in salt and fresh water as well. Both of my parents had great insight and skills. Fun fact! Flour companies realized that people were making clothes from their sacks, so some started putting patterns on the inside of the sacks. :) It was much more fashionable and helped people feel less embarrassed about wearing flour sacks. Both of my grandparents grew their own food. They would buy bread and protein – but their gardens were a cornucopia of fruits and vegetables that they would share with their neighbors, kids and grandkids – no wonder we all grew up healthy. And these were suburban backyards – not farms! Think of all the money and effort that is put into gardens and lawns to make them look pretty – it’s crazy that the same effort would save families thousands of dollars a year. AND make them healthier! I love all of these old tricks! I have a set of grandparents from Mexico, and a set from the hills of Arkansas who moved to AZ during the depression, and they both utilize frugal skills. My nana totally washes aluminum foil and sandwich bags, and my grandpa still lives in the 2 bedroom house that his grandparents built. I am always reminded to eat everything on my plate because as we are often reminded, maybe not often enough – there are many who do not have anything to eat. And if we are not eating it we had better find a way to cut the cost and give away to those who need it. As a new home owner, it’s be tough dealing with others saying that owning a home is not an investment. To me it is and that’s what it boils down to. I am not for renting and love having physical assets (home). I agree in owning a home and wish more people would see it as a physical asset rather than a negative alternative to investing everything in the market. @Laurie – I don’t know why more people don’t sit down and listen to the older generations to learn from them? @John – my grandpa was the same way. He always managed well the little he had. @Alicia – I was watching this video yesterday from PSU.edu that said the very same thing. That people on farms weathered the depression a lot easier than city folks. Mainly because they were able to raise their own food. @Anita – I feel like there is still folks around from that generation that we all still need to learn from. Grandpa and Norman are gone, but there are still others we can learn from. Unfortunately, a lot of them are in nursing homes. Glad I could bring a smile to your face, and remember the things our elders taught us! I have a sneaky suspicion that these skills will be needed in the future. @Adam – I like that! Masters of thrift! @Beth – My friend, coworkers, and family make fun of me when I get excited about saving money! I physically let on about my happiness by either clapping or rubbing my hands together. :) haha Seriously. Patti – I didn’t realize that about the flour sack dresses. It makes sense though. Probably was about the same cost to make the ugly and nice flour bags for the corporations. This article brought back so many memories of my grandma, who taught me a lot about being resourceful. I was nodding my head while reading. She must have learned a lot of her ways during the depression. One fond memory: She always took worn clothing and cut out the “good” parts to make quilts, or best of all, doll clothes for my dolls. Regarding the flour sack dresses, did you realize that when the flour companies realized that the farm women were using their flour sacks as sewing cloth, the companies began using softer fabrics and pretty patterns as a sales incentive? I wonder, maybe some of those flour sack dresses could have been Sunday best! I love your notes; reminded me of my parents and grandparents in the Philippines. a lot to save money. It feels so great and felt proud of your self that you will be able to save money from your frugality. And it makes a big difference in your life. Wow Charlie, you really got me reminiscing today! I remember how we cleaned our plates with a piece of bread and I still do to this day! Also if there were any scraps leftover they didn’t go to waste, they were fed to the dog and cats! I grew up learning everything from cooking and sewing to welding. Those skills have served me well throughout my life so far. I feel privaliged to have been raised the way I was. I’ve never had a close extended family so it’s interesting to hear how they used to get by in these tough times. We can all learn a lot from the masters of thrift! My mom learned how to can and sew from my grandparents who went through the Depression and she taught us kids how to do the same thing. I can relate to many of the comments given like peeling the potatoes and being careful not to take anything more than the skin off. I can still hear my father telling me to turn off the lights when you leave the room. Also, to be watchful about wasting water…not to just let it run while brushing your teeth and also we’d flush only when it was necessary. EEE!!! Saving wrapping paper and aluminum foil another trick that I still employ. They had some good advice and it’s wise to heed. Thanks for sharing Charlie! Waste not, want not. Charlie, thanks for renembering my dad! As you did, I learned so much from both him and your Grandfather, I miss them both a lot! I try to implement everything they taught me everyday of my life. My great-grandparents grew up in The Depression, but they had it a bit easier because they lived on a farm and were essentially self-sufficient. My father grew up in a multi-generational home and had many stories about how his grandparents were much more cautious than any “normal” person is now. I remember as a child being scolded for peeling too much flesh off with the skin when peeling potatoes. Better yet, why did you peel the potato in the first place – just give it a good scrub! Or how my Mom was embarrassed to take lobster sandwiches to school instead of store-bought bologna because lobster was “poor people food” (yes, I live on the East Coast). I try to follow my grandparents leads as much as possible in their meal planning since they were raised by those who lived through significant hardship. Makes me realize how far a dollar can stretch. Really enjoyed reading this post.. reminded me of my own grandparents and what they (and their own parents) did back in the day. No matter what, the underlying theme always seems to be “waste not.” In addition to doing some of the things on the list you wrote up, they also would go as far as to save wrapping paper from presents and wash aluminum foil and reuse it! Nice post Charlie! I saw many of the same things with my grandparents – especially my grandfather on my Dad’s side. He grew up on our family farm and was pretty much able to fix/make anything he put his mind to. He didn’t make a ton of money, but handled it so wisely – and was able to live a good life as a result. LOVE this, Charlie. I always, always think about the Depression as we work toward paying off our debt – it’s a driving force for me, just recalling about how so many of them didn’t think their debt was a problem and then, BAM! Suddenly they couldn’t make their payments anymore and were up the creek without a paddle. Listening to the wisdom of people like your beloved grandparents is SO important. We can learn so much from them.